Taking a train ride out to the Blue Mountains is probably one of the cheaper things you can do from Sydney, and well worthwhile. It is true that the blue mountains don't look especially blue, at least at this time of year. They also don't look very mountainous, at least from the top. Then you approach the cliff face and look out on unbroken forest for as far as the eye can see. For Europeans, the sight of so much forest, without a single road or building is quite special. It's also a forest with an alien quality, full of unfamiliar trees and birdsong. The communities along the top of the cliff seemed to have vied with each other to create impressive cliff walks to attract tourists. From Katoomba we went down the giant's stairway of 900 steps, some carved out of the rock, some reconstructed out of metal ladders. 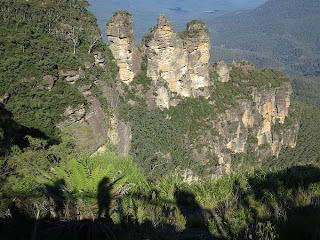 It passes around the three sisters, an important landmark for the Aboriginal people. After a nice flat walk through the forest, we came back up the cliff on the world's steepest funicular train. The next day, at Wentworth (we went and it was worth it - Mike), we took an equally steep stairway down the cliff, then an amazing path constructed along the cliff face about halfway up. This time, we had to climb back up around a waterfall. We decided Wentworth won the best path competition by a small margin, though Katoomba is a better place to stay.